Check out this fantastic photo tweeted out by Alex Cheremeteff‏. 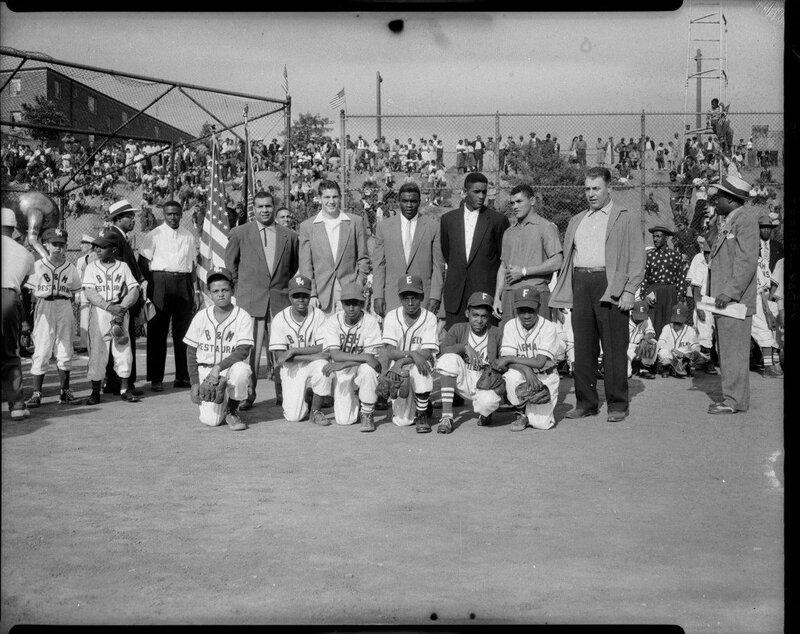 Dated to 5/29/1953, it features several old-tyme Dodgers ushering in a new season for the Uptown Little League at Kennard Field, Pittsburgh. 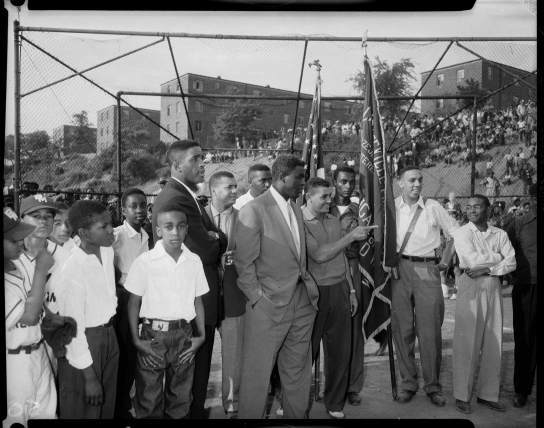 On the top row are (from L-R) Roy Campanella, Gair Allie, Jackie Robinson, Joe Black, Carlos Bernier, Sam Narron, and Ronald Gray holding shoes on left. Photo was taken by Pittsburgh photographer Charles “Teenie” Harris during his 40-year career with the Pittsburgh Courier. I also ran into another photo of Harris' from this day located in the archives of the Carnegie Museum of Art that you can check out on the right. This Day in Dodgers History: In 1979 the Dodgers signed free agent starting pitcher David Goltz to a six-year $3MM contract. The former eight-year Twins veteran went 9-19 with a 4.25 ERA in three season with the team before being release in 1982. "It's a huge honor," Bellinger said during MLB Network's unveiling of the award. "I have to give a lot of credit to Paul and Josh, too -- unbelievable players. To take this award home with me is really special." "Obviously, we didn't have our end goal this year," Bellinger said. "But we're going to try to take it to the next level next year. ... It's definitely a motivator. I know the taste in everyone's mouth after we lost was sour." RIP: Bobby Doerr. Per Richard Goldstein at the NY Times; "Bobby Doerr, 99, Hall of Fame Red Sox Second Baseman, Is Dead." Via Rebecca Bodenheimer at Pacific Standard; "Yuli Gurriel's Suspension May be Forgotten, but Cuba's complicated Asian Racism Persists." Via Lester Wong at The Straits Times; "Pioneer Hideo Nomo wants more Japanese baseballers to follow him to US." "I didn't feel like I had any problems adjusting, at least on the field," the 49-year-old told The Straits Times through a translator. "I was so excited just from moving to the majors, and I remember being really pumped up when I threw out my first pitch," added Nomo, a guest for a clinic organised by the Singapore Baseball and Softball Association and charity Three Hearts Foundation at the Kallang Diamond, where 200 kids were in attendance yesterday. This seems like quite a friendship. Per TMZ; "Vin Scully & Yasiel Puig - emotional reunion... On Bev Hills Street Corner!" "The Dodgers are excited and extremely proud to be returning to Mexico as a team for the fourth time in our history,” Dodger President and CEO Stan Kasten said. 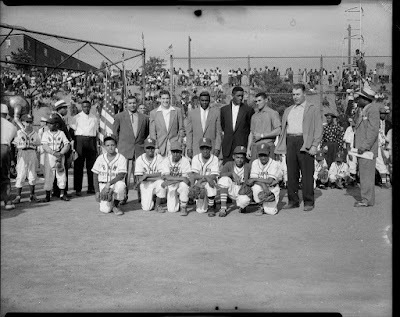 "These games will also mark the first time that the Dodgers are playing regular season contests in Mexico, something long overdue, given our rich player history and strong community ties to the country. The Dodgers have always been at the forefront of growing the game of baseball internationally and this trip reinforces this commitment, while at the same time giving our many fans in Mexico a chance to see us compete." Between Keibert Ruiz and Smith, the Dodgers have one of the better catching situations in the minors. Smith has made up for missed time from the 2017 season by hitting .362/.449/.517 in the AFL. The former Louisville star is very athletic for a catcher. Here a few kids I look forward to seeing in Dodger Blue someday. Via Eddie Poe at MLB.com; "Dodgers prospects impress as Glendale rolls to win." Outfielders Yusniel Diaz, the Dodgers' No. 5 prospect, and DJ Peters (No. 17) helped lead the offensive effort for Glendale along with catcher Will Smith (No. 8) as the Desert Dogs eased past the Mesa Solar Sox, 10-3.